Chicago cooks have caught the canning bug. 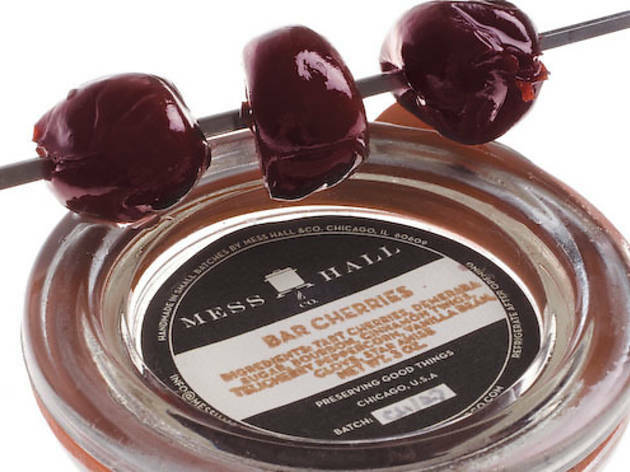 MBA Mess Hall & Co.'s bar cherries. Where there’s seasonal eating, there are pickles. Without them, a seasonal restaurant in the winter would be left with no (preserved) berries for ice cream, no tomato (jam) for a burger. For chef Marianne Sundquist, the close of summer induces a sort of mania. “I go into panic mode,” she says. “I need to get as much [produce] as I can and save as much as I can.” And it doesn’t stop in the summer. Just last weekend Mark Steuer, the chef at the Bedford (1612 W Division St, 773-235-8800), conducted a test run for a pickled restaurant concept, where even the cocktails use pickling brines (it’s aptly called “Pickled”). Over at Birchwood Kitchen (2211 W North Ave, 773-276-2100), chef Jesse Williams has a line of preserves. And at the same time Steuer was prepping for his pop-up, Sundquist was quitting her job at In Fine Spirits to pursue her pickles and preserves company, Mess Hall & Co., full-time. Can chefs really make a living off pickles? 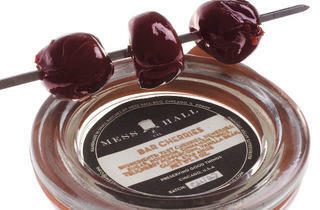 Sundquist reports a huge response to the first products in her line, a ghost pepper spicy mustard and bar cherries. So the answer is, naturally: Yes. They can.